The finite nature of security resources mandates prioritizing the deployment of security measures. That means a security analysis should concentrate on the few assets that are most critical to the business. Which are they? Making that determination is not just Security’s task. It requires the expertise of the corporate personnel who utilize and depend upon those assets. It involves knowledge outside of security’s domain. This means that security practitioners must enlist the aid of a group, committee, team or panel to help identify and prioritize the most critical assets and business processes. What makes assets critical is the severity of the impact on the business if use of the asset were lost. Using a simple application of Pairwise Comparison, you can help the group perform a rudimentary business impact analysis, in a methodical way results in group consensus for the for the team’s findings. The pairwise comparison technique leverages the universal human ability to compare single properties of alternatives. In plain words, it’s easy because we already know how to choose between two things. We do it all the time. In a pairwise comparison a whole list of items is ranked by comparing only items two at a time, and assigning a numerical rating to the comparison. Adding up the ratings produces a score for each item. Some items score higher than others; the numbers document the ranking. 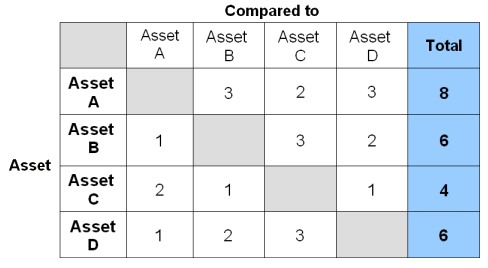 What follows is a description of the critical asset ranking process using pairwise comparisons. Purpose: To determine the most critical assets of the business, and rank them in terms of the severity of the loss of use of the asset. Start with a list of candidates for being a “critical asset”. Identify the “worst-case loss event” for each asset-the event that would have the worst impact on the organization. Write down a description of the event. Add up the values in each row and write the total for each asset category in the Total column. The assets with the highest scores are the most critical assets, according to your assessment team. This activity does not require that each team member be highly knowledgeable about each asset. As long as there is at least one person who can explain satisfactorily to the rest of the group why the loss of one of two assets would have the greater or equal negative impact on the business, the group can reach a consensus about the asset pair. One by one each asset pair can be addressed and rated. Figure 1. The pairwise comparison chart. Because a relative scale of measurement can be used, a pairwise comparison approach for critical asset ranking significantly reduces the time to obtain consensus. It helps to ensure that time spent on more detailed analyses is well spent by focusing on the critical assets. Usually there is an added bonus in that the protective measures selected for the critical assets often also apply to less critical assets, or can be easily extended to cover more assets at an incremental cost. Fortunately such advanced techniques are not necessary for the simpler task of identifying and ranking an organization’s critical assets. Do you have a critical assets catalog for your organization? If not, the pairwise comparison tool can help you develop one more quickly. 16 Secret Weapon for Securing Security Systems! 25 Do You Have Nonsense Security? © 2006-2013 by Ray Bernard. All Rights Reserved. Permission is granted to reprint identifying The Security Minute as the source and Ray Bernard as author.